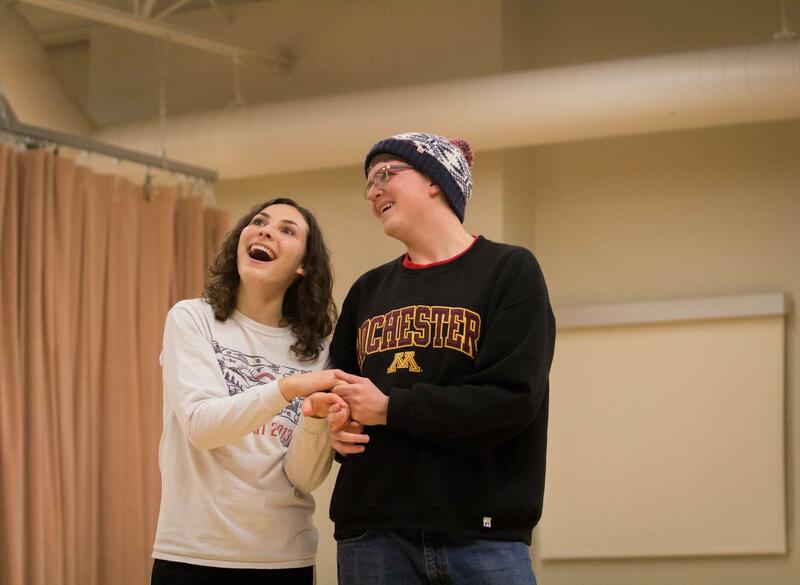 Annika Peterson (‘19) and Karl Nycklemoe (‘18) show affection during a scene. Lights, camera, laughs! 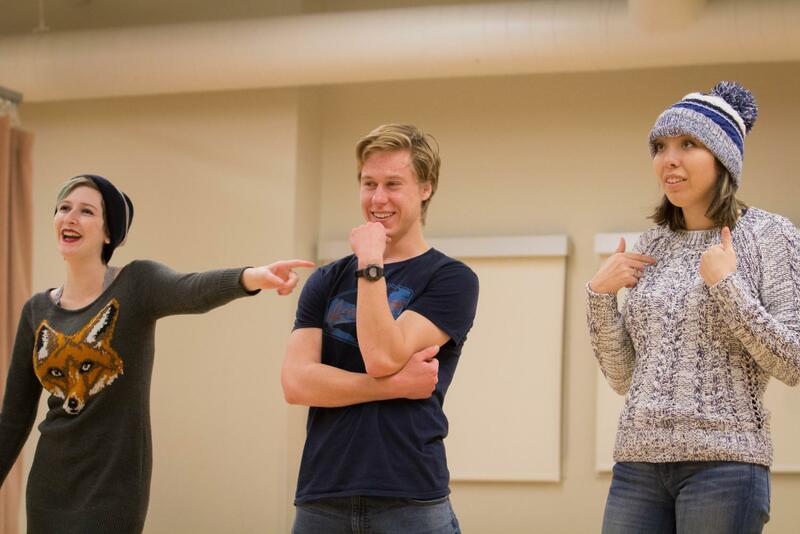 Top Banana, Luther’s only improv troupe, performed in Storre Theater on Friday, Feb. 23. All seats were filled ten minutes before the performance with attendees sitting on the stairs, the floor, and leaning against the wall. Top Banana member Vince Grube (‘21) was excited to perform for the full house. The show started off with a game called “Late To Work.” Scene participants mimed to Top Banana member Karl Nycklemoe (‘18) why he was late to work, how he got there, and where he worked. The audience provided the details and decided that Nycklemoe was late due to menstruation, arrived via speedboat, and worked at a slaughterhouse. According to Top Banana member Emma Brashear (‘18), improv is a form of acting in which the audience plays a significant role. The next game was called “Build a Better Bear.” This game involved three actors being assigned the letters “D. A.,” and the actors then invented movie titles that could be abbreviated by those letters. The audience voted for the scene they wanted to see via applause. Annika Peterson (‘19) won the audience’s votes with “Damnit, Alexa!” The scene ensued featured an Amazon Alexa — played by Hope Shishilla (‘21) — reading her manual to her owners. Adrienne Lee (‘19) lets out her frustration at a Top Banana practice. The show ended with a game called “Our Town,” which is played at the end of every Top Banana show. After the audience gives the actors a town name, in this case “Slimy Sasquatch,” the actors introduce their characters and begin the scene. In this scene, the second-prettiest Princess Lila, played by Shishilla, and Sassy the Beautiful Sasquatch, played by Peterson, competed to be prettiest. Emma Brashear (‘18) volunteers Vince Grube (‘21) for an improv game. Shishilla thought this was Top Banana’s best show so far this year because the group trusts each other. 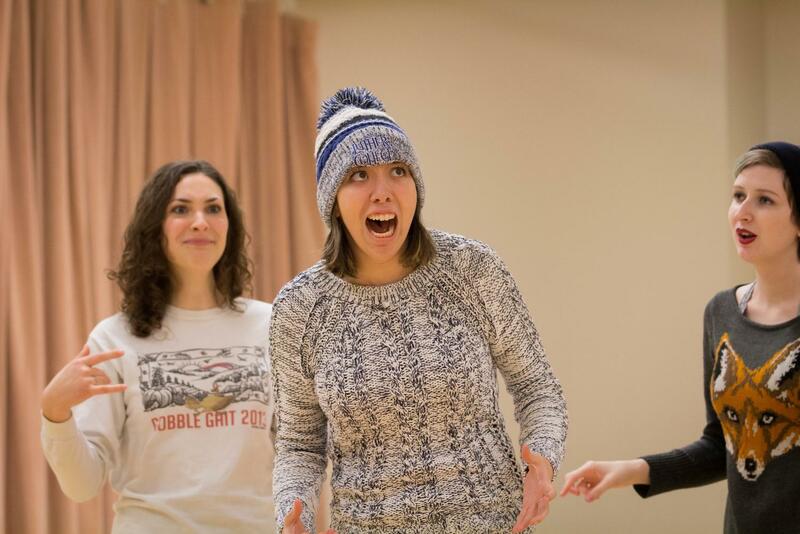 “There’s a kind of trust that you have to establish for an improv group, because, unlike a performance group where you rehearse and have a structure, I have to know I can depend on this other person [during a scene],” Shishilla said.